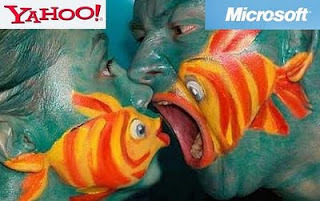 After very long waiting period, finally official declaration for deal between Microsoft and Yahoo came out. Summary of 10 years deal between Yahoo and Google is as below. It will actually happen only after they receive regulatory approval. Yahoo Search Marketing, Panama, will be powered by Microsoft adCenter. Microsoft will get "data on who's doing what online" from yahoo. It will be huge benefit for Microsoft. Yahoo Search will now be Powered by Microsoft Bing. Still Google will be the leader in Search Market. Google currently receives 65 percent of the U.S. search engine activity, while Yahoo! controls 19.6 percent and Microsoft 8.4 percent. You can read below articles/discussions to know what others are saying about this Deal. It seems people are worrying about yahoo mail, thinking that it will become another hotmail. Does Microsoft + Yahoo = A Privacy Arms Race Among Web Giants? Why did Bing and Yahoo hook up? Search engine giant Google Inc said it was "interested" in Microsoft's 10-year search deal with Yahoo announced on Wednesday, adding that competition was usually good for online users. The new Internet-search venture between Microsoft Corp. (MSFT) and Yahoo Inc. (YHOO) is likely to face considerable scrutiny from federal antitrust regulators, according to government officials and analysts. is this a win-win agreement for both Microsoft and Yahoo? The once proud warrior of the internet space laid down its sword, knelt at the feet of Microsoft and gutted itself today.